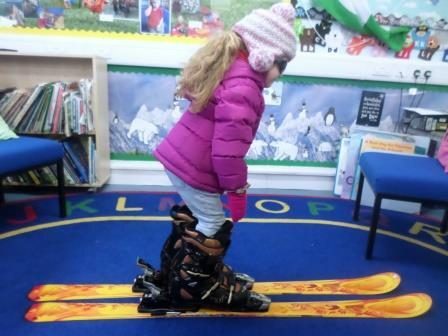 To get the New Year off to a flying start Lismore Primary School had a “French Alpine Ski Week” to celebrate all things alpine and wintry! We have taken the overall theme in French of the alpine year and have a large changing display in the classroom. 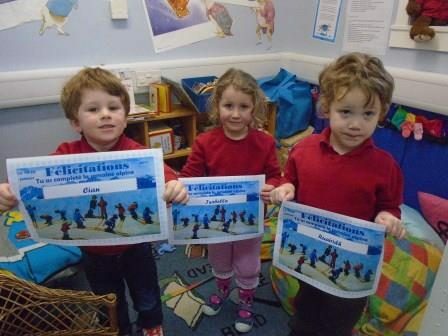 This week, we imagined we were all off skiing to the French Alps! After locating the Alps on a map, the children were kitted up in ski gear and had their photographs taken for a virtual ski frieze. 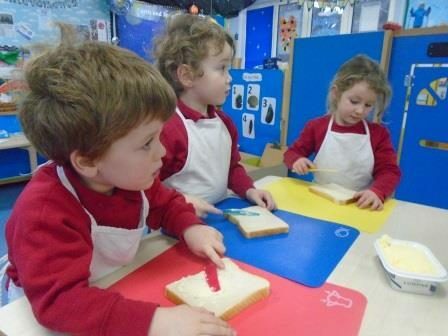 The children learned the French words for the various items of clothing and did a costings exercise in euros and pounds. 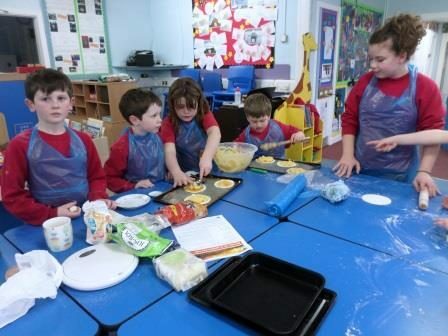 Each day the children had a French menu which included cassoulet, croque monsieur and even a fondue. 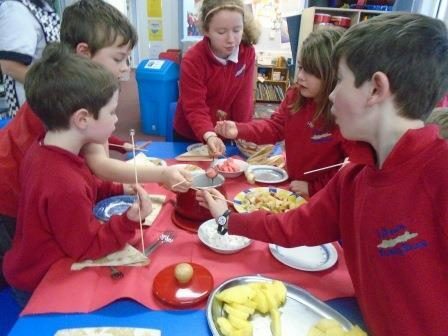 There was also a cheese tasting session where they learned about a variety of alpine cheeses such as Chevre, Gruyere and Reblochon. 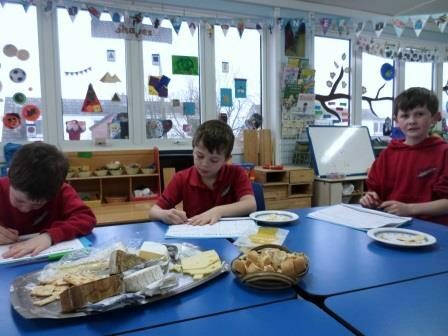 They were able to smell and taste each of the six cheeses and then noted down their thoughts in a table. Emmental was very popular and also the hot melted Reblochon. However, there was less enthusiasm for the strongest tasting Tomme de Savoie. 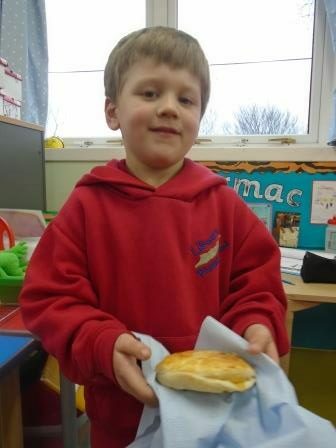 As it was still the season of Epiphany the children all made mini Galettes des Rois which they took home to share with their families. A small raisin was hidden in each of the apricot jam and frangipane filled pastry cakes. Whoever found the raisin in their portion of the cake would be king for the rest of the day. The children learned how to do some ski exercises and found out which muscles are used for skiing. They also had a go at virtual skiing and snow jumping using a Wii. In order to score well on this they needed to show good balance. Each child had a journal which they had to complete in very simple French stating the day, date, weather and what they had done. They were also challenged to make a very simple PowerPoint presentation of some aspect of the French Alps. Topics varied from animals of the Alps and the clothes you need for skiing to snowboarding and alpine cheeses. 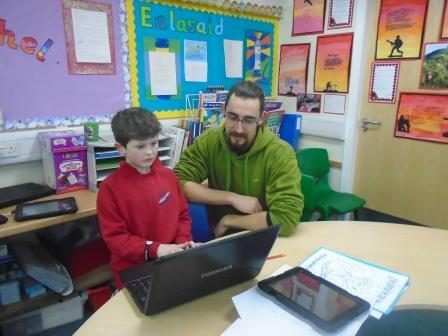 A French student who is staying on the island visited on the final morning and the children showed and read their presentations to him. We had hoped to visit Nevis Range to go on the gondola and to see some real skiers in action but Unfortunately the weather was not good enough. Instead, the children made dioramas of a ski scene and used the ipads to make an animated film of themselves skiing down the mountain! The week finished with the children completing an evaluation sheet and the presentation of a certificate to each child. We are hoping to build on the children’s enthusiasm and knowledge during the rest of the term so that they become familiar with this vocabulary before moving on to summer in the Alps.